I love it when that happens! The background color dissolves before the designs do and you're left with the skeletons of the pattern. I wish I knew of a way to clean this up a little (remove all traces of background color and touch up the color on the hearts) so I could wear it like this. I could just do a Konad stamp over a bare nail to get a similar effect, but I like the metallic design and raised look of these. Ah, well, looked cool while I was removing it at least. That's a Wet n Wild loose glitter I picked up last summer. It's so pretty, I'm going to have to use it again and try to get it to show up in a picture. My Valentine's look ended up being Sugarpill Tako, Sugarpill Dollipop, MAC Passionate, and then the pastel Wet n Wild glitter over Tako. Pastel opal glitter looks awesome over white. 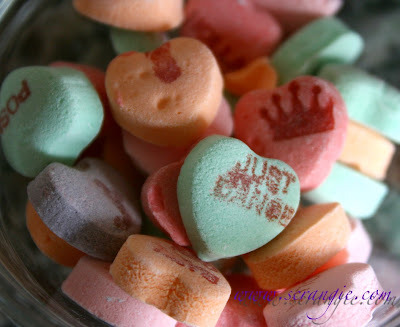 They're Necco Sweethearts Dazzled Tarts. I don't know if you can tell, but they're glittery. Look at the one to the right of the one that says "Girlz" and you'll see the glitter. Glitter candy. That's kinda cool, but I'm still disappointed that they changed them and that the new ones are really half-assed looking. I mean... look at these. Some of them don't even have anything on them, you can't read half the ones that do, and some are just random pictures. And they say hilariously cheesy things like "LOL" and "holla". Oh... not that kind of Holla? And what is that one just above the Lady Gaga reference supposed to be, anyway? I'm going to go with "disco stick." Yeah! I loved that too! And some really metallic colors change, too- I remember some Zoyas that did that really well. Zoya Edyta goes pure olive-gold when you start removing it and the dark teal green base goes first. It's really kind of cool. I love the skeletons, too ^.^ That glitter is gorgeous... I might have to run out and pick up the wet n wild glitter so thanks for sharing! Gorgeous eye makeup! Wish I didnt work with old men so I can wear all my bold colors during the week. A shame you can't keep that look on the nails. The only thing I can think of is to find a nail wrap patterned that way. Not the same thing I know but, needs must and all that. I prefer my UK version... Look for Love Heart Sweets on google. I think you'll be jealous of our sweeties. I had the same realization about the Sweethearts, so sad...they basically changed what was good about them! Now they are gross :(. I'll just go get Necco wafers then, I guess! Way to make me snort at work. Disco stick indeed. What on earth is a disco stick anyway? Don't answer that, my prudish mind can't deal. Your makeup came out awesome! I love the glitter. I went with Sugarpill Goldilux. I was wearing a lot of red already, so I wanted to stay away from getting all matchy matchy with red or pink. Goldilux is so amazing. I just ordered a few more Sugarpill colors during the sale, but I forgot to get Tiara!! Your comment just reminded me. GAH. I approve of this post for the Final Fantasy XI reference!! Love it! 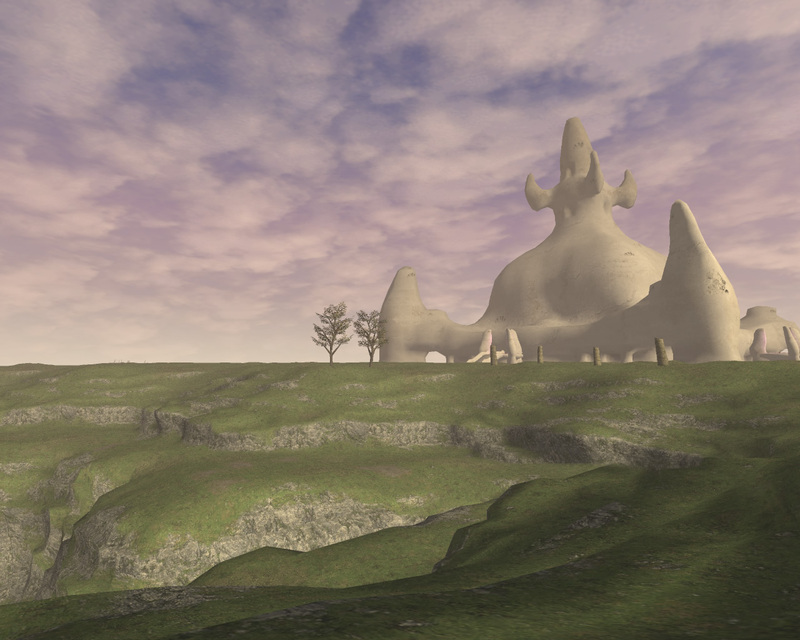 I approve of this post for the Final Fantasy XI reference! Love it! Beautiful eye makeup- love the opal glitter. Was it formulated for the eyes? I'm always concerned about glitters being eye-safe. I have a jar of MAC reflects transparent teal that I'm always dying to use on my eyes but never have because it's not "eye-safe". Boo. Maybe I'll mix it into some polish and see what happens. 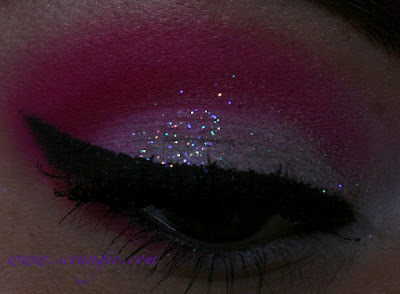 My Valentine's eye makeup ended up being Parfait Amour in the crease/lower lash line and Fuchsia pigment on the lid. I was really happy with how sickeningly sweet it ended up looking. Very Valentine's-y. I thought of David Bowie first, but then I couldn't make the Disco Stick joke, haha :D I adore that man. 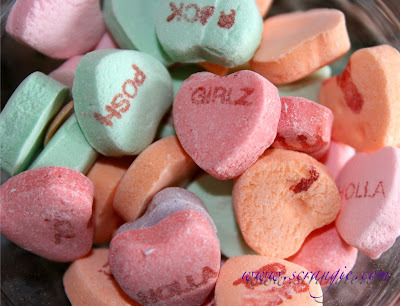 Ew, they ruined the candy hearts! This happens to me all the time when I'm removing polish. I stop halfway through like, "What would happen if I just threw topcoat on this ... ?" OK - you guys have me with tons of new ideas and also how to approach taking off my polish to get 'that look.' Normally I work on on nail to over kill on taking off before moving on to the next. I can see I have some experimenting to do! Good news as I have major surgery bills coming in from last Nov now and 3rd phase of the surg. coming up (with it's bills)...so I have to really hold back on buying polishes. I can ONLY (I decided) get a few out of some of the new major collections and give up on getting some of the older ones I am still looking for. Zoya Edita was the best for changing when you were removing it. All the green disolved quickly and you were left with a beautiful bronze! I have Edita and cannot wait to start this technique with that one! Thanks gals so much! Your eyes look amazing! You need to give us a tutorial on how you do your winged liner. I know you have mentioned never works with a pencil liner - agree - I too need a brush and gel and am getting better with some of the liquid pens but they can be super messy. Waiting for my Stilla liner to come to try that pen out. I Love it! The hearts looks lovely on bare! I LOVE your eye makeup! It's gorgeous :) And I'm so sad that those heart candies aren't as good as they used to be. They're one of my favorite seasonal candies, even though a lot of people don't like them. I love your eye makeup for Valentine's Day! It's so pretty. And I'm really sad to hear that those conversation hearts aren't as good as they used to be. I haven't had them in awhile, although they used to be one of my favorite seasonal candies.